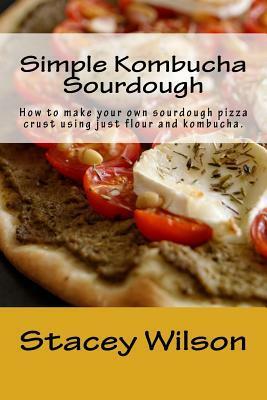 Title : Simple Kombucha Sourdough: How to Make Your Own Sourdough Pizza Crust Using Just Flour and Kombucha. Really excited about this book. I have to be honest, I have always liked bread baking. My mum used to make all our bread the old fashioned way (no bread makers then! ), and she would get us involved as soon as we could reach the bench or table top from a stepping stool. So I'm not sure how old I was when I learned to love making bread at home. Don't get me wrong I'm just an enthusiast not an expert. But mum never got the knack of sourdough so I've always been a bit wussy too. The idea of wild yeast in my kitchen air for my bread conjures up images of grey or disturbingly pink sludge. So the idea that I could make a starter with something more reliable is SO APPEALING! Plus I'd never heard of kombutcha either so the added bonus of learning to make a tasty drink at home for my kids sounds good too.I found Stacey's writing style very accessible and fun as well informative, and the concise, summarised method have left me with a real sense of confidence as does the fact that she has an Msc in Biochemistry, she really does know her stuff, and as I read her book I got the sense that she had done her homework about bread baking, pizza making and kombutcha. She provides references for further reading about making your own kombutcha and looking after your SCOBY, so along with her own description on the process I feel quietly confident that I won't kill it, or make some sort of creature from the black lagoon. I'm really quite keen to get into it but have forced myself to hold off on getting a SCOBY (symbiotic culture of bacteria and yeast- look I learned something!) until I have made a designated spot for my kombutcha jar, it has even given me enthusiasm for spring cleaning my wee kitchen, so I must be keen. I really want to 1) make my first batch of kombutcha drink, 2) make a few pizzas and 3) see if I can adapt the method for making ciabatta as this is my family's favourite bread. If I can make an amendment or additional notes on this review I will keep you all updated. Itching to bake now! Thanks Stacey!